When Bill Ford Jr. stepped down from the top job at Ford Motor Co. last month and handed the steering wheel of the embattled car maker to Alan Mulally, it was a move many applauded. "An outside perspective is exactly what this company needs," says John Casesa, managing partner of Casesa Strategic Advisors LLC, an automotive and financial consulting company in New York. As the former chief of Boeing Co.'s commercial airplanes unit, Mr. Mulally proved his ability to handle a company in crisis when he helped pilot the giant plane maker back from a wrenching downturn after the 9/11 terrorist attacks. In appointing Mr. Mulally as president and CEO, Ford joined a growing list of companies -- especially those facing tough times -- handing the top job to outsiders and not homegrown talent. 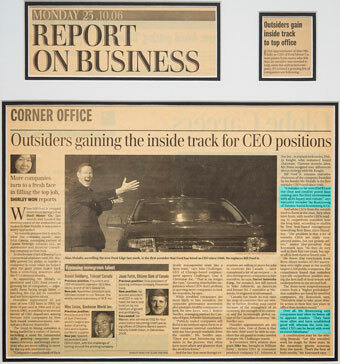 Outsiders represented 43 per cent of new CEO hires in 2005, up from 34 per cent in 2004 and 35 per cent in 2003, according to an annual survey of CEO departures among Fortune 1000 companies by New York-based communications consultancy Burson-Marsteller. The trend to hiring outsiders is being fueled by a variety of factors, including a need for turnaround skills, growing corporate governance concerns, and foreign executives who are more willing to move for the top job, recruiters say. "Companies used to think of their inside management team like a farm team," says John Challenger, CEO of Chicago-based outplacement agency Challenger, Gray & Christmas Inc. "That is no longer the case." Growing shareholder impatience when CEOs don't perform is spurring more companies to look for outsiders, he says. While troubled companies are more likely to hire outsiders, the corporate governance movement also prompts healthy companies to look for new faces, says J. Robert Swidler, managing partner for Canada of Egon Zehnder International. "Publicly traded companies will feel it is incumbent upon them to at least compare internal candidates with the best people available from the outside," Mr. Swidler says. "Once you start introducing outsiders to the process, they often have more allure and glamour than the devil you know." And the fact that more foreign executives are willing to move for jobs in countries like Canada -- once considered a bit of an outpost -- is also driving more companies to hire outsiders, he says. Nortel Networks Corp., for instance, last fall turned to Mike Zafirovski, an American and former No. 2 executive at Motorola, to engineer a turnaround. "Canada has made its way onto the map of countries that are worthy to further develop your career because of the resurgence of its economy, the strength of its currency and the increasingly global nature of the Canadian economy," Mr. Swidler says. Outsider appointments are not without risks. One of them is that the new chief won't be able to convince the old guard to make needed changes, Mr. Challenger warns. In December, 2004, athletic shoe giant Nike Inc. brought in William Perez , former CEO at consumer products company S.C. Johnson & Son Inc., to replace its founder, Philip Knight, who remained board chairman. Thirteen months later, Mr. Perez resigned over differences about strategy with Mr. Knight. Bill Ford Jr. remains executive chairman of the company founded by his family; Mr. Mulally is the first outsider CEO hired since 1946. "It remains to be seen if he'll have the clout and credible power base coming into the Ford environment with all its legacy and culture," says executive recruiter Jay Rosenzweig of Toronto-based Rosenzweig & Co.
And while CEOs from the outside tend to flame at the start, they often later fizzle, with insider CEOs tending to outperform outsiders over the long haul, according to studies by New York-based management consulting firm Booz Allen Hamilton. "The problem is that a lot of outsider CEOs are really turnaround artists, but not growth artists," senior vice-president Paul Korcourek says. "So they do very well in their first two years, but taper off in their third or fourth year." He draws that conclusion from Booz Allen's studies of CEO succession over eight years at the world's largest 2,500 public companies. The consultancy found that outsiders typically outperform insiders during the first half of their tenure and underperform in the second half. The short-term out performance comes from a "higher probability" that outsiders are hired by troubled companies, Mr. Korcourek says. "Outsiders tend to take more drastic action in their first two years in office than insiders would." Over all, Mr. Rosenzweig says companies may often be better off to appoint insiders. "They have more allies and have established good will, whereas the [new outsider] CEO can be faced with overt or covert bitterness." A combination may be the winning formula. "Let [the outsider] work his magic for three years. In the meantime, groom someone from the inside. That's the best of both worlds," Mr. Korcourek says.